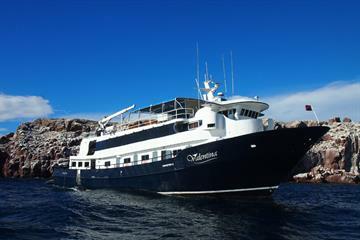 Liveaboards to San Benedicto, part of the Socorro Islands, or officially known as, the Revillagigedo Archipelago, will be escorting divers to one of the best dive areas for seeing large palagics. The Socorro Islands are a group of four volcanic islands located in the Pacific ocean about 400km (250mi) off the coast of the southern tip of Baja California; a south western state of Mexico. This archipelago is a popular dive area and most popular for the different pelagic species which you will have a chance to see and dive with. 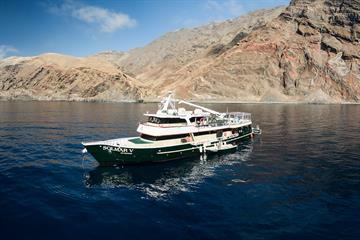 The other three islands are Socorro Island, Roca Partida and Clarion; all incredible dive sites in their own ways. Roca San Benedicto is the second smallest of the islands; an uninhabited island with volcanic crater, lush green forestry and is 10km squared. This island is teaming with life above and below the water. San Benedicto, and the rest of the Revillagigedo Archipelago, is a year round dive area, but each season brings its own gems. 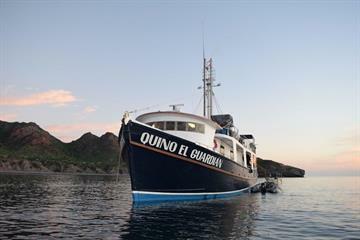 Due to it's remote location this area is best reached by a liveaboard cruise. The calmest seas are from November to May with the waters being around 28 degrees Celsius (82 degrees Fahrenheit) in November, 21 degrees Celsius (69 degrees Fahrenheit) in February and back up to 25 degrees Celsius (68 degrees Fahrenheit) in May. These winter months also bring with them the main spectacles; the many pelagics species which migrate through here but also the permanent residents of this area which are the Giant Pacific Manta Rays and many species of sharks. The visibility here depends solely on the plankton in the water which depends on the moon, but in general the visibility varies from 15 - 50m (49 - 164ft). 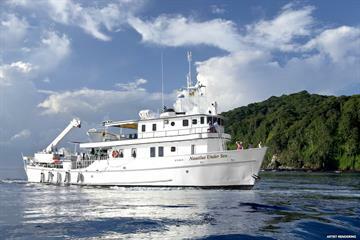 San Benedicto is an open water dive area and so has more advanced diving areas. 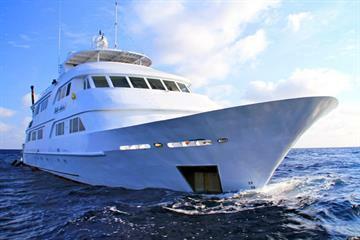 Sometimes there are strong currents and big waves, and most dive spots are quite deep, however, each liveaboard which visits this area has their own minimum dive experience level, most expect divers to have Advanced Open water with at least 50 logged dives, but there are a few which only need you to have your Open Water and no minimum logged dives. Please keep this in mind. The most popular spectacle here at San Benedicto is the world famous Boiler. This is a cleaning station for the Giant Pacific Manta Rays to which divers can truly come up close and personal with. They really do justice to their name as 'Giant' is really what they are; their wingspans measure up to 7m (20ft) but they are the gentle giants of the sea. They are very curious and will come and investigate the divers and hang around the whole time, but they are also incredibly shy, so if they are chased they will take off. 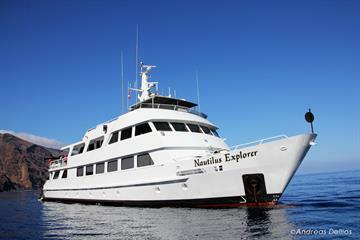 This dive site is a pinnacle and you can swim around this pinnace multiple times in a dive; flying side by side with the Mantas. Great, not budding with dolphins and mantas. But definitely with sharks. It allows you to appreciate the finer things. Drifting Pariente's Rock exposed us to much marine life, including a tiger shark. We did our dives there on the first day. Well...nice for a warm-up!